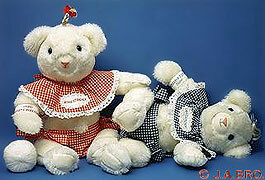 Multi-talent J.A.BRO'S first and unique "Baby-Bear-Pairs" were made in 1985 and registered in Germany 1986-1989. New to that time, were the own-created patterns & shapes of the bears that allow the limbs, which are curved like those of babies, to be floppy and fall realistically in every position the body is moved to. 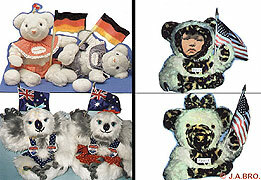 New in 1985 was on the international market too, that all of J.A.BRO'S unique baby bear-pairs have got a loch of hair with blue or pink bows and as a special attraction, they got a round belly button covered with white mohair or synthetic fur. The eyes are large and blue, in glass or plastic and the snouts are kept in white kid leather and/or vinyl. J.A.BRO'S koala baby-bear-pairs got hands and fingers stuffed with synthetic wool. 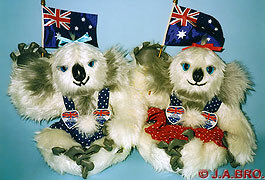 All faces are stitched by hand, J.A.BRO'S koalas got additional eyelids and eyelashes cut out of grey felt. All J.A.BRO'S baby-bear-pairs are wearing fashionable clothes of J.A.BRO'S copyright.